The West Highland Terrier is that of a small, game, well-balanced, hardy-looking Terrier exhibiting good showmanship, possessed of no small amount of self-esteem, strongly built, deep in chest and back ribs, straight back and powerful hindquarters on muscular legs, and exhibiting in marked degree a great combination of strength and activity. The coat should be about 2 inches (5 cm) long, white in colour, hard, with plenty of soft undercoat. The dog should be neatly presented. The ruff of hair around the head should act as a frame for the face to yield a typical Westie expression. Males should measure 11 inches (28 cm) at the withers, Females 1 inch (3cm) less. Colour and Pigmentation: Coat must be white, as defined by the breed’s name. Nose must be black. Black pigmentation is most desirable on lips, eye-rims, pads of feet, nails and skin. This breed is alert, intelligent and fiercely independent. Families looking for a cuddly lap dog should look elsewhere. 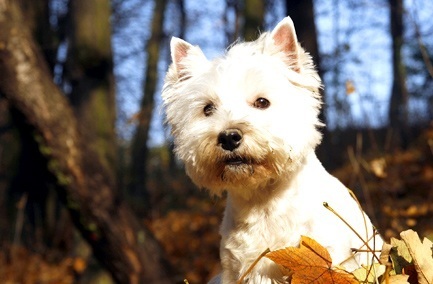 Westies are generally healthy although they have a high incidence of food and environmental allergies (Atopic Dermatitis).